Due to your feedback and the additional impact of the grassland update we have decided to expedite the performance improvements and not to wait with the optimizations until the end of the Early Access phase. In order to do that we have begun implementing the first upgrades from the Tombstone Engine, the successor of the C4 engine. Thanks to the new ring detail system the visibility tests will be strongly improved, which adds a load relief for both the CPU and video cards. The Tombstone engine will additionally provide a better multicore support in the future. The weather is essential for the drying of swath. Until now there was sporadically random weather with quantities of fog and rain. For the grassland update we are optimizing the weather system so that sunshine hours and rain have an influence on the drying process. 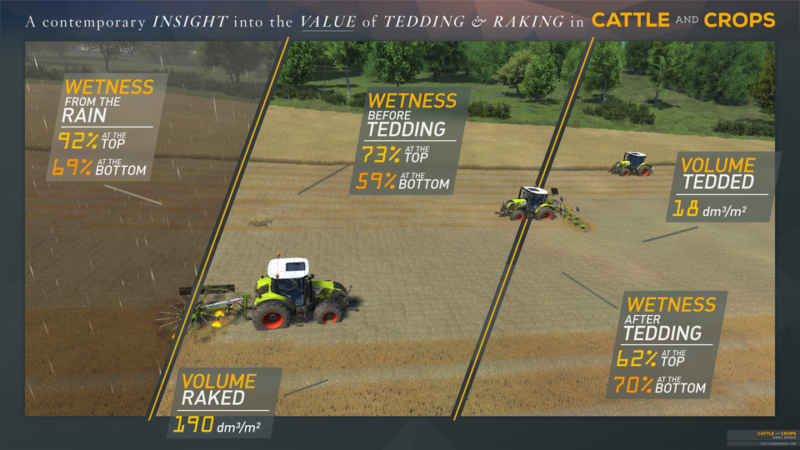 In order to recreate a realistic tedding procedure we have added wetness parameters for the upper and lower surface of the swath, where the upper surface dries faster than the lower surface for example. Tedding is therefore an important part of the drying process to produce hay fast and efficiently. With the grassland update the Claas Volto 80 will join the existing vehicle fleet.enabling you to tedd the cut grass or straw to guarantee an optimal drying process. A small addition to the last modding news: the twist axis of joints has been separated in upper and lower limits so that asymmetrical angles can be set. Joints can now also be moved by movement and rotation controllers which enables more complex animations.